In 1995, Lawrence Kiwanuka who was partially involved in Uganda’s politics in Democratic Party (DP), fled the country after multiple threats by government forces. He currently lives in New York – United States of America and works as Professor of Government and History at State University of New York. He was forced to flee the country after repeated arrests and detention. At the time, he was the chief editor of The Citizen and Munnansi Newspapers. Prof. Kiwanuka calls Uganda’s President Museveni a congenital liar, corrupt, self- proclaimed “Big bull in the kraal” and warmonger, among others. When you are a first time visitor to Uganda, you may think that the country’s citizens are happy. 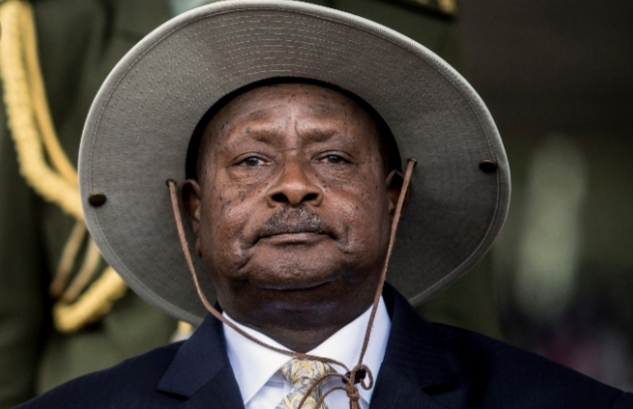 Yet, almost entire population of Uganda live in extreme state of fear – orchestrated by President Museveni and his inner circle, claims Prof. Kiwanuka in an interview conducted late Wednesday, March 27, 2019. As a journalist and partially a politician, Prof. Kiwanuka narrates President Museveni’s government right from the first year he assumed power in 1986. But his discussion starts way in the middle when he fled the country to live in exile. Towards 1995, Prof. Kiwanuka was aligned with Democratic Party ideology. And as a practicing journalist, he started exposing Museveni government’s human rights abuses. He reported about detention of people in military barracks, detaining of people in unknown places, which he now describes as safe houses that ‘are all over the country’. All this annoyed Museveni government and the military started turning against Kiwanuka. His fate had just started. “We pushed hard and Museveni thought that detaining us was the best punishment and he is still the same person today. Because if you saw him last week in regards to an MP of Kyadondo East Hon. Robert Cyagulanyi Sentamu commonly known as Bobi Wine, when he was addressing his cadres in Kyankwanzi he said that Bobi Wine was just punched a little bit by the soldiers. Because of such acts I was repeatedly arrested. They would arrest and detain you for two three days, intimidate you and later release you after some time – probably because of international pressure,” says Prof. Kiwanuka. After several arrests, says Prof. Kiwanuka, “I was never charged in court. At some point, military officers attempted to bribe me not to reveal the information. At the time, military officers who tempted to bribe me were from Directorate of Military Intelligence (DMI) which currently changed to Chieftaincy of Military Intelligence (CMI),” says Kiwanuka. According to Prof. Kiwanuka, Museveni’s military machination within Uganda and the region has been arresting and detaining people in unknown places without police records. “There are so many other people who have gone through what I experienced. Some of us were lucky enough. There are some people who have died in detention. I had a friend whom I worked with as a journalist called Hadji Hussein Musa Njuki who was arrested by these people. They took him all over the place and later dumped him at a police station. Police would later release him after few hours because of extreme torture he had experienced. He immediately died. The list is too long,” says Prof. Kiwanuka. In Museveni, says Prof. Kiwanuka, “We have a person who is very intolerant of serious opposition. For instance why is it that Museveni all these friends with whom they fought together in the bush, senior leaders…majority of them are no longer with him? Some have died while others have been detained. We have cases of Gen. Kazini. And immediately a year when Museveni came to power, he arrested and detained Dr. Andrew Kayiira. And when he was brought to court, I think it was on February 20, 1987. Musevei said that Kayiira was a criminal and should be punished. Within 10 days on the 6th of March, Kayiira was assassinated. This was a very popular leader from Buganda. Then Museveni executed fake commission of inquiry, then invited the Scotland Yard to come and visit the country. They investigated and up to today, the report on the Kayiira murder has not been released 30 years down the road. This is the same way he assassinated Kaweesi, Ibrahim Abiriga, and Anthony Sekweyama, Noble Mayombo who was poisoned, Francis Ayume and many others. These I am mentioning are people in high offices. He continues: “There is one MP called Betty Namboze who was trying to stop Museveni from changing the constitution. She was badly beaten, went for surgery in India and came back from treatment. She was arrested again and beaten. There is a common known story of Dr. Kiiza Besigye…you see I always tell people that Kizza Besigye was Museveni’s personal doctor. If somebody cannot trust their personal doctor, for me when I see these fallouts with Museveni and other political leaders in this region, it is because they have done things that make them shine more than he shines,” says Prof. Kiwanuka. By further describing Museveni’s behaviours towards other leaders in the region, Prof. Kiwanuka takes a step further to South Sudan. “Take a case of John Garang. We talked to people within the system in regards to how Museveni fell out with John Garang. Museveni had major issues with Acholis from Northern Uganda and many of them were living in exile in South Sudan. There were also soldiers of Joseph Kony who were in South Sudan and Museveni wanted to deploy his soldiers to move these people out and Garang said you know what lets have peace talks, deal with Kony and leave Acholi refugees in South Sudan alone because it is difficult for you to differentiate between an Acholi from Uganda and the one from South Sudan. Museveni was kind of disappointed by this because in his mind he helped Garang during times of war and thought that if he said something Garang would just jump. And when Garang became a man on his own, what did Museveni do? It is because of that reason that Garang was eliminated. Museveni worked so hard and had him replaced. We have seen that ever since, Museveni has been on the power clench of destabilized South Sudan. The people of South Sudan have internal conflict,” Prof. Kiwanuka says of President Museveni. He adds: “This game was repeated in Congo. He disagreed with Kabila. He sought his way into Congo and now Uganda owes Congo $10 billion because people who were involved in looting such as Sam Kuteesa, Yoweri Museveni, Kahinda Otafire and Salim Saleh are just enjoying wealth. You remember Junk helicopters that were caught in Beralus and Salim Saleh was discovered as the purchaser after he had received $100,000 bribe. He accepted having taken the bribe and instead of being told to return the money, Museveni just said he was forgiven. With these kinds of criminal acts, there is no tangible development they are bringing to the country. That is the story. So this is the kind of a person we have in the Great Lakes region,” says Prof. Kiwanuka. “People in Uganda need to rise up and stand firm and do whatever they can to change this regime. Moreover, problems in Uganda will continually spill out to other neighbouring countries. This is because Museveni always wants his soldiers to be engaged somewhere and never listen to citizens. According to Prof. Kiwanuka, Museveni’s warmonger has gone on to blindfold the International Community by deploying his army as a scapegoat to engineer his destablisation of the Great Lakes Region. “There is a case of Somalia. There was a scandal when soldiers from other countries were involved in selling weapons to Al-Shabaab. Museveni’s soldiers were also involved in these scandals because it is alleged that they were not paid well because their leaders were eating their money. And every time International Community asks Museveni about this, he threatened that he is helping them in Somalia. According to Professor Kiwanuka, the primary victims of Museveni’s regime are the ordinary citizens. He says the economy has severely gone down – hugely due to corruption within the system. For instance, he says, “Look at the Health sector which is hugely financed by donors. This Monday, the Speaker of Parliament suffered flight fatigue. Just flight fatigue. But she was flown in to Kenya for treatment. This simply means that there was no competent hospital in Uganda to treat fatigue. Uganda has gone for about 15 years without a Cancer scanning machine at the national referral hospital. I find this primarily because of corruption and poor planning. The way Miuseveni handled the affairs of our economy has totally created two classes in our country. The majority very poor and the rest are rich. And this wealth is created through corruption. Let me give examples; there is a suggestion that Uganda is going to build a hospital worth $480 million near Entebbe road and there is a serious company coming to build this hospital. Now these people claim that they are investors and Uganda has provided them with money to build the hospital. When we checked, the aggregate they provided in the Arab Emirates is equal to a furniture showroom. Furthermore, there was so much pressure in the country because other countries in the region have carriers and Uganda doesn’t have. So Ugandan Airlines is coming back, but information came out yesterday that even though Uganda is the one who secured the loan for the Airline, the government is only owning 0.9% of the shares. So there is a question on who owns 99.1%. So who is this person? All these cracked deals have affected Uganda. Basically there is away Museveni allows all these corrupt people to go on. There are so many other examples. Museveni as an individual has created all these problems to the country. Unfortunately, he has created a system around himself that is going to be very dangerous. For example, there is a time Sam Kuteesa owned Entebbe Airport for about 11 years and he had bought it for just $1 through his company – Entebbe Handling Services Ltd (ENHAS) and nobody could question it because government was part of the deal!. Now here in New York, someone has been convicted for giving a bribe of half a million dollar to Museveni and Museveni said it was a gift. So corruption is normal in Museveni’s government,” Prof. Kiwanuka said. According to Prof. Kiwanuka, “Because of corruption and ill-gotten wealth, Museveni is very much scared of leaving office. This is because government, his business and personal family entities have become one. So if he leaves office he is going to be questioned. That is the extreme hang on time to time all way. In his final analysis of Museveni and his tactics in the region, Prof. Kiwanuka says that cases that Rwanda has tabled to Uganda of its citizens being detained in unknown places, brought in Court Martials and charged with possession of firearms is no surprise to him. “If you have been following Uganda under Museveni you should not be surprised when that happens. People are always charged with fake evidence planted against them. Now the only change that we should worry much about them is that Rwandan people are not being taken to civilian courts. They are being taken to military courts and the rules of evidence that apply in the military court are not the same as those in the civilian courts. I think for the Rwandese nationals who are being detained, it is going to be a responsibility of the region and the International Community to push the government of Museveni to allow these people retain their freedom. They say that there are Rwandese nationals who are killing people in Uganda…we have heard people arrested in cases of Kaweesi, Abiriga, Kirumira and others but none of them is a Rwandan. Not even one is of Ugandan-Rwandese extraction. All are pure Ugandans. And Museveni had told us in the past that these people (killers) were actually radical ADF Muslims who were carrying out the assassinations. Now they become Rwandese. The man is just a congenital liar,” Prof. Kiwanuka says.